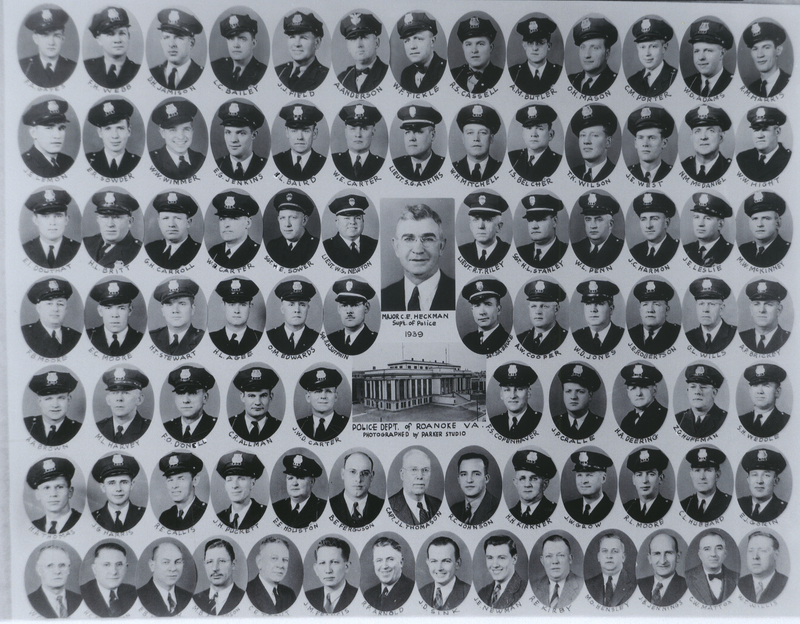 Composite photograph of Roanoke Police Department. Pictured are: F.A. Gates, F.H. Webb, D.H. Jamison, L.C. Bailey, J.J. Field, A. Anderson, W.F. Tickle, R.S. Cassell, A.M. Butler, O.H. Mason, C.M. Porter, W.D. Adams, R.M. Harris, J.E. Lemon, E.R. Sowder, W.W. Wimmer, E.J. Jenkins, H.L. Baird, W.E. Carter, S.G. Atkins, W.H. Mitchell, I.S. Belcher, T.K. Wilson, J.E. West, N.M. McDaniel, W.W. Hight, E.I. Douthat, H.L. Britt, G.H. Carroll, W.B. Carter, H.E. Sower, W.S. Newton, R.T. Riley, H.L. Stanley, W.L. Penn, J.C. Harmon, J.E. Leslie, M.W. McKinney, F.B. Moore, E.C. Moore, H.T. Stewart, H.L. Agee, O.M. Edwards, R.H. Sutphin, S.A. Bruce, A.W. Cooper, W.D. Jones, J.E. Robertson, G.L. Wills, A.P. Brickey, A.A. Brown, M.L. Harvey, F.O. Donell, C.R. Allman, J.W.D. Carter, F.S. Copenhaver, J.P. Cralle, H.A. Deering, Z.G. Huffman, S.H. Weddle, H.A. Thomas, J.G. Harris, R.E. Callis, J.H. Puckett, E.E. Houston, B.E. Ferguson, J.L. Thomason, R.C. Johnson, H.H. Kirkner, J.W. Grow, R.L. Moore, C.L. Hubbard, E.J. Gorin, J.M. Francis, R.P. Arnold, J.D. Sink, J.E. Newman, R.E. Kirby, M.O. Hensley, J.B. Jennings, C.W. Mattox, and W. Willis. Parker Studio, “PS 280 Roanoke Police Department,” Virginia Room Digital Collection, accessed April 21, 2019, http://www.virginiaroom.org/digital/document/PS280.